By LUDWIG VON KOOPA - Phone interviews are a thing. Thank you for contacting us and for your patience in awaiting our response. After reading your email, I can certainly understand your concern in this situation. I would be more than happy to forward your feedback regarding being able to purchase M-rated digital download-only games via the Nintendo eShop with parental permission. Your comments will be made available for other departments here at Nintendo to view and use as they see fit. I also want to know that we may be able to resolve this issue, but we would need to speak with you (and a parent) directly in order to see what we can do for you in this situation. At your earliest convenience, please contact our Consumer Service Department by calling 1-800-255-3700. Representatives are available to speak with you seven days a week (except for major holidays), between the hours of 6:00am and 7:00pm Pacific Time. In order to speed things along, please have your system with you when you call. Thanks again. It's nice they thanked me for my patience, although it'd be more nice if I got unbanned from Miiverse early due to my other e-mail. Well, that one didn't go anywhere. If you compare the two e-mail responses, you'll notice some differences. One, they address me by name! Ha! Ms. Perry is better versed in empathic listening than Celilo Nordal. Celilo Nordal put my feedback in Nintendo's files three months ago and Ms. Perry now has something to reference the current feedback with. Something completely new this time: Ms. Perry wants me to call Nintendo of America. And have a parent. To resolve my situation. I have no idea what she is implying here, but if they have a way to bypass this via NOA HQ that isn't one of the two methods we've discussed already, then this is news that KoopaTV needs to break to the public. ...Except, I'm not under 17. I (and hopefully every reader here is helping the campaign) am advocating for those that are. So now is the time where KoopaTV goes from e-mail to phone. We had the opportunity to do so with Electronic Arts earlier but they toll you if you call them. And there was no way they would've answered my question given the circus they were making otherwise. Here, Nintendo's phone number is free. So I called them on April 29. The following conversation is all paraphrased since I was taking notes while engaging in the conversation. Press 1, 2, or 3 for various options, blah blah blah. Your call will be monitored and recorded for quality assurance. Eventually I got to the woman and I didn't actually write down her name. Woops. She asked what my name was and for an e-mail address and I paused for a while on what to say. Well, I put in the e-mail that my name was Ludwig... so... better stick with that. My name is Ludwig Von Koopa, from Ludwig_von_koopa@yahoo.com. I didn't mention KoopaTV. She doesn't need to know this is being published. She asked about the spelling and her first instinct was right ("Is that K-o-o-p-a"?). She asked what my first name was and I said it was Ludwig... and I was sensing how awkward this was. I said that I’m calling in response to the web form that said to call Nintendo and ask them questions. Then I explained (so I'm pretty much monologueing for over a minute here) that people have trouble downloading M-rated games and mentioned Dual Destinies as an example. Since it’s download-only, there is the disadvantage there and all that. So I asked if someone called in and said that they put in that their birth year was 2001 but they typo’d it and really meant 1991, would they change the birthdate unconditionally? I also wanted to mention that I have no problem buying M-rated games personally but am advocating for those who cannot. I asked how to do that. She said to call this number, (1-800-255-3700) and talk to an agent like her on Nintendo Network manners. People like her would send service requests to the consumer back office who will unconditionally change the birth date. They theoretically could do a check to see if they’re telling the truth, but apparently they get a lot of requests that they’ll just change it within a day or two and not get your information deleted in the process. You don’t directly call the back office (that’s probably why it’s called a back office), they get requests. So that was surprisingly straightforward. She's a customer service person, so obviously asking her for an eShop overhaul wouldn't go anywhere. Then I changed topics. 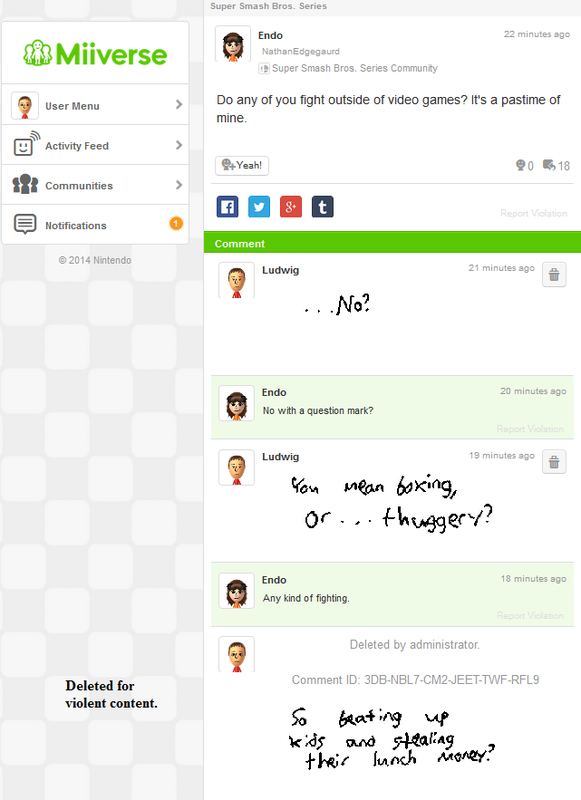 I said, Well I'm actually banned from Miiverse right now, so I was wondering, are Miiverse reports handled by a human team or entirely by software? She says she will look it up. Then she did. 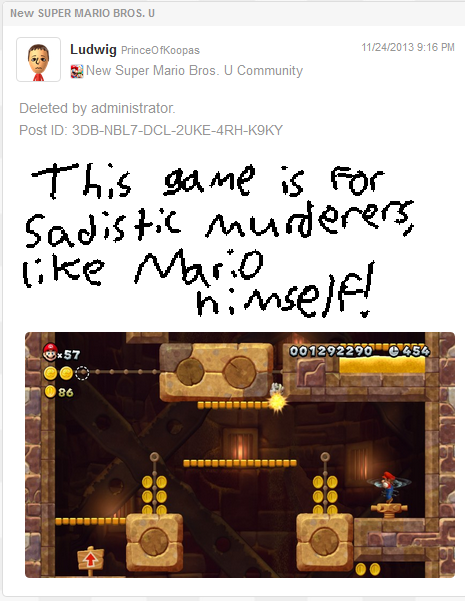 When it comes to Miiverse moderation, partially software and partially human. Software looks for descriptor words like swears. Would it look for friend codes? I don’t know because I don’t have a full list of things it looks for in front of me, but it would look for something similar to a friend code, or a credit card or phone numbers. Humans would look at conversations if they have these descriptors (the software sends flags to a queue) and look at the context of the conversation and make a determination. Can it recognize handwritten posts? Not that I'm going to suggest to people to, uh, make handwritten posts to violate the rules or anything...! Yes, but up to a point. That's more limited than the typed posts, but there is software in place that looks for written messages on the computer. How does the report process work? A human will look at it. Someone will report a post, it will go to... CS2... is what it’s called, they’ll look at what is reported, and they’ll look at the context around it. When a user disputes a violation and says they did not violate the code of conduct, does that also go to the human team? Yes, we wouldn’t leave that up to software. CS2 is part of Nintendo. Similar to Consumer Back Office. It has different sectors it works on. Well, my NNID is PrinceOfKoopas, but I won’t ask to be unbanned because… that’s happening in two days anyway. Okay, thank you for answering my questions. HOLD IT! Um, oh, by the way. Whoever came up with that Play Nintendo E3 video idea… is a genius. .........I watched it myself. It was quite entertaining. Okay, thank you. Have a good day! Key take-aways: Until Nintendo changes their eShop service, you can call them at their Nintendo Network part of their phone number and say you made a mistake in your NNID birthdate (or some other excuse so they don't get suspicious at dozens of people calling with the same "mistake") and they will change it for you relatively quickly without verifying the accuracy of your statement. That said, if you're prepubescent, have someone with...a deeper voice to sound more convincing of that. But they will do so without cost to you and unconditionally. When Iwata announced that Miiverse would have both a software component to its team and a human part, he was right. Surprisingly, it's not outsourced like, you know, EA. Which not only outsources but off-shores. Apparently customer service people keep track of Nintendo's antics, too. Those customer service people don't really have good judgment, but, uh, they're there. They exist. They're just also in the back-office and you can't talk to them directly. Handwritten posts are not completely safe, but they are obviously less vulnerable to auto-detection. I'm guessing posts with words like "murder" and "stealing" are auto-detected even in hand-written if they're written clearly. If your posts have more abstract ways of breaking the rules, then they were likely reported. And humans do look at these. They don't have a sense of humour, unfortunately. KoopaTV doesn't like that. Until Nintendo changes their eShop ESRB policy, the workaround of calling Nintendo to change your birth date is apparently the way to go. Oh, and sorry about not complaining about that whole 3-minute restriction thing. Have any ideas for an investigation? Tell KoopaTV! Call Nintendo, but convince your parents it's the right thing first. Ludwig calls Nintendo a year later, this time regarding the Deluxe Digital Promotion and how he can get his lost codes back. The solution to this problem WITHOUT calling a Nintendo representative. It's actually a fact that Nintendo contracted out Miiverse moderation duties to other companies. This will be very helpful for people who have been unable to get Dual Destinies since the accounts were linked. I cracked up laughing at the part where the person on the phone was clarifying your name. Yeah. We knew before that Nintendo suggested to either delete your NNID (well I guess they didn't "suggest" that) or call them, but plenty of people were hesitant on calling them for one reason or another. Or that it didn't work when they tried calling them. So maybe they didn't frame it correctly when calling them. They won't turn the request down if it's a mistake, apparently! I had no idea they were going to ask my name and e-mail. ...It makes sense in hindsight why they would ask my name (to talk more... personally), but the e-mail part? I didn't actually verbally express the underscores in my e-mail address (she asked if it was @gmail and I said no, it was @yahoo) so if Nintendo sent a follow-up e-mail as a result of the call, they sent it to the wrong dude! "...and talk to an agent like her on Nintendo Network manners"
Manners? Is that a typo? But it's in green-coloured font. So it must mean she said that.